Take a Trip to the U.P. Without Leaving Your Front Door! Between the cities of Munsing and Grand Marais on the northern shore of Michigan's Upper Peninsula (or "The U.P.," if you're a local), is one of the most stunning shorelines in North America. Established as the first of its kind in 1966, the Pictured Rocks National Lakeshore covers 42 miles of beaches and bluffs along Lake Superior, the crown jewel of the Great Lakes. Named for the sandstone cliffs that are illustrated with mineral streaks of nearly every color imaginable, the Pictured Rocks makes a perfect destination to immerse yourself in the beauty of the natural world. Of course, that doesn't mean you have to stand in awe the entire time! At Pictured Rocks, there are plenty of things to do in all four seasons of the year. 100 miles of trails will lead you to treasures both in and out of plain sight. Love adventure? Skiing, fishing, canoeing, ice climbing and more await! In addition, Pictured Rocks features plenty of historic sites, including the Au Sable Light Station, that put you right in the middle of the area's rich nautical past. 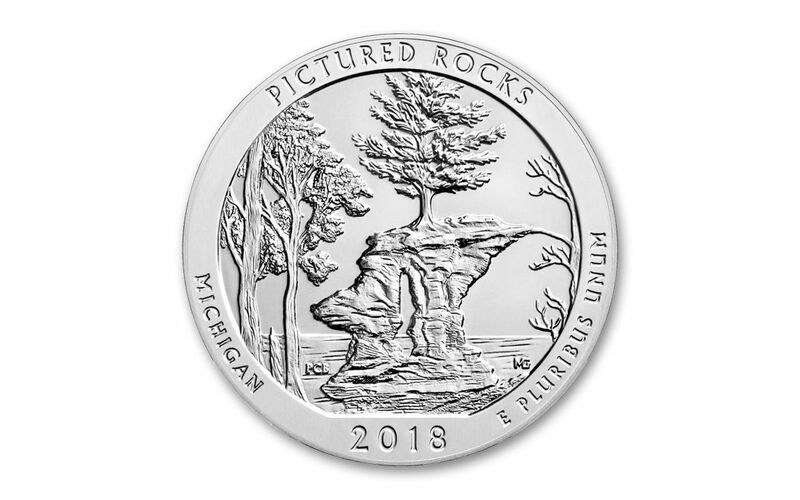 Even if you can't travel to Pictured Rocks right now, you can bring one of its famous landmarks home to your collection with the latest from the United States Mint's America the Beautiful Quarters® Program, struck in five ounces of stunning silver! ILLUSTRATIVE, INSPIRING DESIGN . 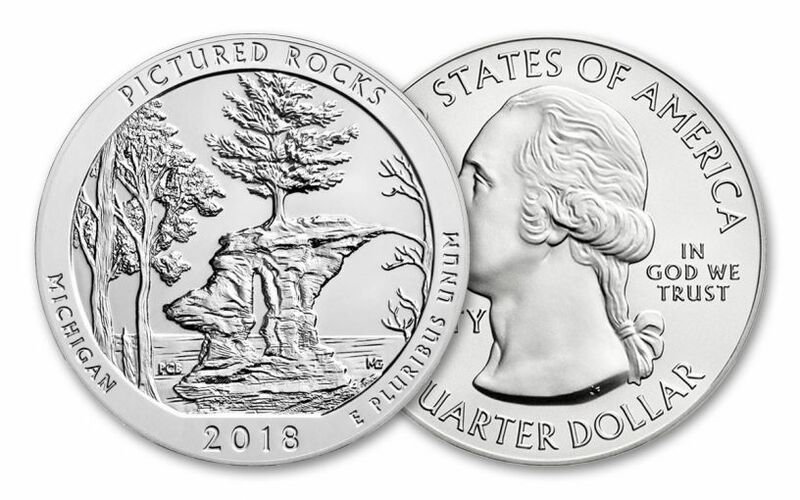 . . -- From designer Paul Balan and sculptor Michael Gaudioso, the very first of 2018's America the Beautiful Quarters features a perfectly picturesque view of the Lakeshore's amazing Chapel Rock. Carved by centuries of lake water, this unbelievable natural attraction symbolizes the unmistakable wonder of the area.
. . . STRUCK IN FIVE OUNCES OF SILVER! -- Struck in a weighty five ounces of 99.9% fine silver by the Philadelphia Mint, each coin has a massive diameter of three inches and thickness of over four millimeters, but still has a legal tender value of 25 cents! Incused edge lettering confirms that your coin is, indeed, ".999 fine silver 5.0 ounce." GORGEOUS BU CONDITION -- Your 2018 5-oz Silver Pictured Rocks Bullion Coin will arrive to you in Brilliant Uncirculated (BU) condition, exactly as it left the Philadelphia Mint. A COLLECTORS' FAVORITE SERIES! 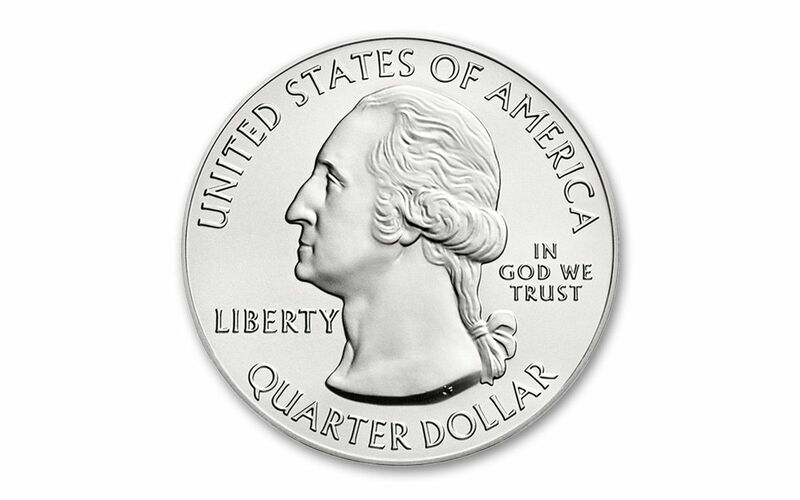 -- This debut America the Beautiful Quarter release of 2018 continues the popular series, first established in 2010 and still attracting new collectors to the fold! Whether you're a native "Yooper" or call the shore your home away from home, a devotee of great coin art or a stacker looking for superb silver, this 2018 5-oz Silver Pictured Rocks Bullion Coin is an awesome slice of nature. Don't miss out -- order yours now!